Not to be confused with PictoChat 2. 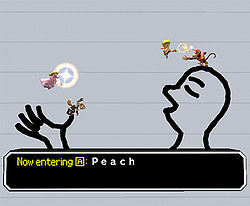 PictoChat in Super Smash Bros. Brawl. PictoChat (ピクトチャット, PictoChat) is a Super Smash Bros. Brawl stage based on the software for the Nintendo DS of the same name. In the beginning, the stage consists of a flat, blank stage. As the match continues, pictures are drawn in. Some have different effects, like a face that blows wind at the players, rails with a moving minecart, a giant Piranha Plant and much more. The only static platform is a "now entering" notification. Although the lower end of the main platform can sometimes be seen, it is impossible to go under and around it. Oddly enough, for a stage that appears technical and futuristic, the crates and barrels appear in the present form instead of the stainless steel form, and although this takes place inside a game system, the characters are still 3-D, unlike Flat Zone 2, where characters are 2-D.
Fire Two floating bodies of fire are placed at the center of the stage, which deal 1% flame damage and mid-to-low set knockback on contact and can juggle players. Missiles Two rockets fly in from each side, which explode in a comical animation when touched. Like the fire, they have a set knockback no matter what the player's damage percentage is. Both rockets deal 25% each. Minecart A half pipe-esque structure with a minecart. The cart deals 10% to players if it hits with the sides. Characters can ride on top of it, similar to the Rolling Crate. Spikes Spikes appear on both sides of the stage. They deal 20% damage if touched, but the set knockback will not usually KO. Blocks Blocks are stacked upon one another. Players can move from block to block by jumping. This is the only drawing sketched in 3D, even though characters still walk on it as if it is a 2D plane, due to the perspective of the game. Springs Springs appear on the sides of the stage and function the same as the item of the same name. Carnival Ride A plus-shaped Ferris wheel with four platforms, much like the one found in the Stage Builder. Pendulum A pendulum with a platform. Gusty Gus A large face appears on the right and blows a strong wind that pushes characters to the left side. The face also serves a small platform, though it is sometimes difficult to access. Farm A house and a sheep that moves around in the background appears. Grassy areas are also added on the sides as extra areas to fight on. Piranha Plant A Piranha Plant sits in the middle of the stage. Its teeth deal 10% damage and can KO at high percentages. Whale A whale appears with a water spout. It can be climbed on, including the spout, which is actually solid. Clock The clock's moving hands act as platforms. Spears A row of long, damaging spears appear on the floor facing vertically. They cannot be passed through, but can be jumped over. Unlike some other spikes, they don't have a fixed knockback. They deal 10% each time a character touches them. Eyes Two eyes appear with a diagonal line between them. The line cannot be passed through in any way, effectively splitting the stage into halves. Lines A complex network of hastily drawn lines. Some of them are big and others are small, but they all behave like platforms. Extension This basically extends the length of the stage on either side with raised platforms. House A house with a slanted roof that can be jumped on. Scaffolding Two ladders appear, which lead up to a platform almost as long as the actual stage. Dominoes Five floating dominoes appear, ranging from vertical to horizontal as they go across the stage. They can be used as platforms or as things to wall jump off of. Singing Man A head appears on the right and a hand appears on the left, making some very peculiar platform shapes. Tree A large tree appears with three branches going off in different directions to offer 3 separate platforms. Trees Two pine trees appear, both with multiple tiers to climb on. Boat #1 A boat with a flag floating in mid-air as a basic platform. This drawing is used in the image for PictoChat on the stage selection screen. Boat #2 A boat with a sail on top of shallow water and within boundaries. Umbrella An umbrella/parasol is put in the middle of the stage, working as a slanted platform. Angry eyes Angry eyes - Just two diagonal platforms pointing down and inwards. PictoChat as it originally appeared as Nintendo DS software. This stage is based on PictoChat, which is a communication system that is built into the Nintendo DS. Players can either type or draw a message to their friends with the stylus. 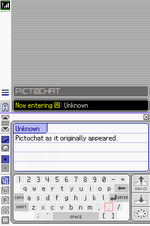 PictoChat contains four chat rooms, labeled "A", "B", "C", and "D". It was originally only accessible from the handheld's main menu and only supported local connections; however, some games, such as 42 All-Time Classics, integrated PictoChat into the interface with online connectivity. The stage itself is an amalgamation of the top and bottom screen of PictoChat: the top screen is where the notification bar and sent messages are displayed, while the bottom screen is where the user would draw or type messages. The notification bar appears as the main platform of the stage, and the bottom screen serves as the basis of the stage's background. The PictoChat stage is always set in room "A". When starting a match, the jingle heard when somebody joins a room is played, and the notification bar displays the name of a character in the same manner that PictoChat did. This stage is currently banned in tournaments. Most of the transformations are unpredictable and overly powerful (such as Minecart, Fire, Missiles, and Gusty Gus) and can significantly affect gameplay. As well as being the home of the earthquake glitch (not including custom stages), PictoChat also has some glitches involving a few Assist Trophy summons. If a drawing with two walls appears while Gray Fox is in between them (e.g. Blocks or Spears), he will be stuck in his run animation backwards & forwards and is unable to escape until he disappears. If Helirin is summoned and rotates near the floor of the stage, characters can be pushed through & below the stage if they walk towards Helirin as it pushes down on them. On rare occasions, Saki Amamiya or Knuckle Joe can become frozen if he jumps on the edge of the stage; he will not disappear and no more Assist Trophies will spawn for the rest of the match. It is possible for Mr. Game & Watch to get into the springs by performing his down aerial twice very quickly. PictoChat, PictoChat 2, and its signature music are the sole things in the entire series that are categorised as part of the Nintendo DS universe. Its logo is the symbol of the DS Lite. This stage is the only one in Brawl in which every track in the My Music selection is from a different game. This stage is also the only default stage in Brawl to not have any events take place on it. A Hothead will fall off the edge, despite the shape of the stage. This is because the stage cannot really be jumped under, and the space "under" the stage isn't really space. Events that trigger the "Now Entering" message (like starting a match or respawning) will be accompanied by the sound of a bell, which also appeared in the original PictoChat when entering a room. PictoChat is one of two stages that does not appear outside of Brawl, the other being Rumble Falls. This page was last edited on April 16, 2019, at 15:24.